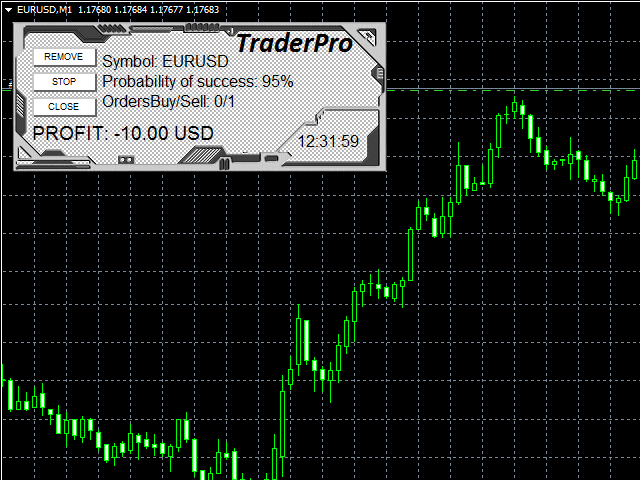 TraderPro is a fully automated advisor for professional trade. In his work, the adviser uses a grid algorithm with hedging positions. Hedging positions increases the likelihood of successful transactions and reduces the risk of losing the deposit. The adviser is established in the usual way on the schedule with the time period M5 and works with any trading tools. To obtain high trading indicators, it is necessary to periodically optimize the parameters of the adviser. A detailed optimization algorithm is described below. The advisor's information panel displays the current Symbol trade symbol, the probability of making a successful transaction Probability of success, the number of open buy orders and the number of OrdersBuy / Sell orders. REMOVE button-removes the EA from the chart. Button STOP - stops the work of the Expert Advisor (pressing again starts the Expert Advisor). CLOSE button - Forcibly closes all open orders of the constructed grid. The default parameters were tested on the currency pairs EURUSD, USDCAD. The table lists the parameters that need to be optimized. IMPORTANT IMPORTANT - Optimization of parameters should be carried out for the year before last !!! For example, you are trading in September, therefore, it is necessary to optimize the adviser for July, not including August !!! Optimization is carried out at opening prices. Test the Expert Advisor by Month. After optimization, it is necessary to choose the most suitable parameters at the lowest drawdown, with the condition that the drawdown is not more than 50% of the initial deposit !!! Do not choose the optimal parameters for the largest profit, as do many novice traders.